Aloe vera is one of the best remedies for any skin-related problems. This contains natural ingredients that treat acne scars, dark spots, sun pigmentation, and even wrinkles. It also increases the glow and radiance of a healthier and better-looking skin. Additionally, this plant helps in exfoliating and moisturizing the skin, making it a good anti-aging agent. Aloe vera can be used fresh or in the form of a mask. No matter what your skin type is, there is a perfect aloe vera mask for you. This can be easily prepared right at the comfort of your home, using the best ingredients available. Choose and try these effective aloe vera mask formula for you. Application: The aloe vera with holy basil leaves and Indian lilac leaves mask is best used for treating pimples and acne. This mask contains antibacterial, antifungal, and antiseptic properties that help kill bacteria. Method: Using a small amount of water, grind the leaves of basil and lilac. Slowly add the aloe vera gel and mix well. Apply on the affected areas, allow to dry, and wash with lukewarm water. Application: The aloe vera with granulated sugar mask is best used for removing whiteheads and blackheads because this mask penetrates deep into the skin to remove the dirt, dust, oil, and dead cells. Method: In a bowl, mix the aloe vera gel and the granulated brown sugar well. Apply on the face and rub in a circular motion. Rinse with water. Application: The aloe vera with ripe papaya mask helps in boosting the radiance of the skin. The papaya component in this aloe vera face mask helps lightens the skin while the aloe vera component helps repairs the damaged skin. Method: In a blender, combine the aloe vera gel and the ripe papaya until it forms a paste. Apply and massage on the face and neck in an upward direction. Rinse with cold water after 15 to 20 minutes. Application: The aloe vera with orange peel powder and lemon juice mask is ideal for tan removal. This mask is rich in vitamin C which reduces the tan lines and lightens other skin marks. It also helps in soothing the rashes and inflammation brought about by too much exposure in the sun. Method: In a bowl, mix all the ingredients until a paste is formed. Apply the mixture in the affected areas and rinse with cold water after 20 minutes. Application: The aloe vera with ripe banana and almond oil mask helps in relieving flaky and dry skin. This mask is rich in moisturizing agents that keep the skin hydrated and prevents dryness. Method: Combine the mashed banana with the almond oil and aloe vera gel. Mix well and apply it to the neck and the face. Gently rub and then remove and wash with lukewarm water. Application: The aloe vera with rose water and cucumber mask is best for removing skin pigmentation. This mask helps in fighting infection, lightening the pigments, and restoring the skin’s natural color. Method: Blend the cucumber until paste form and then add aloe vera and rose water. Spread on the affected areas and let it stay for about 30 minutes. Rinse with lukewarm water late. Application: The aloe vera with tomato mask is good for treating acne and removing scars and blemishes. This aloe vera face mask is rich in vitamin A and C due to its tomato content. Method: Mix the ingredients. Apply and massage gently on the face. Let it stay for 20 minutes before rinsing with cold water. Application: The aloe vera with egg mask nourishes and moisturizes the skin for that anti-aging and tightened effect. This mask increases the skin’s firmness and elasticity which helps prevents wrinkles and fine lines. Method: Mix beaten egg with aloe vera until fluffy. Apply on the face and neck and dry for about 20 minutes. Remove using a cotton dipped in cold water. 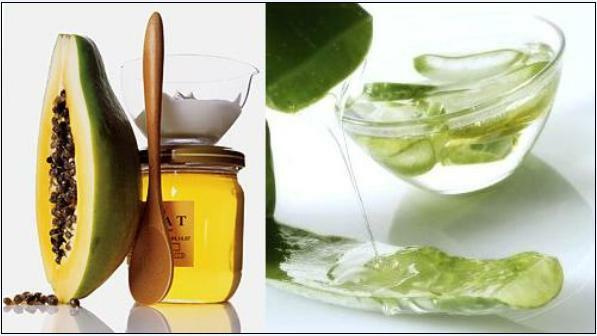 Application: The aloe vera with lime juice and mango pulp mask helps in the detoxification of the skin. This mask contains ingredients that refresh the skin, giving a healthy and natural glow. Method: Mix and blend the aloe vera gel well with the mango pulp and lime juice. Apply on the face and rinse after 20 minutes. 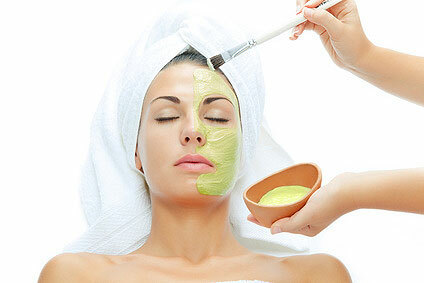 Application: The aloe vera with milk cream, honey, and turmeric mask helps in achieving a fair skin. This aloe vera face mask contains ingredients that have been known to give a glow and enhance the fairness of the skin. Method: Mix all the ingredients in a bowl. Apply on the neck and face for 30 minutes. Rinse with cold water.